CAIRO, Egypt (AP) -- Egypt's antiquities council says that archaeologists have unearthed a 3,000-year-old red granite head believed to portray the 19th Dynasty Pharaoh Ramses II. 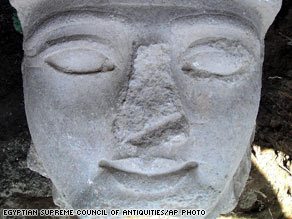 Egypt's Supreme Council of Antiquities says the 30-inch-high head was once on the statue of a pharaoh. The Supreme Council of Antiquities says the discovery was made recently at Tell Basta, about 50 miles (80 kilometers) northeast of Cairo. The council's statement Thursday says the 30-inch-high head belonged to a colossal statue of Ramses II that once stood in the area. Its nose is broken and the beard that was once attached to the king's chin is missing. The site at Tell Basta was dedicated to the cat-goddess Bastet and was an important center from the Old Kingdom until the end of the Roman Period. Archaeologists are still digging at the location for the rest of the statue. We are studying Egypt right now in Chapter 2. Thought this might be interesting. See I told you that History is never finished... it is always being written and re-written.